Check out this fabulous tutorial that combines two great things… felt and flowers! 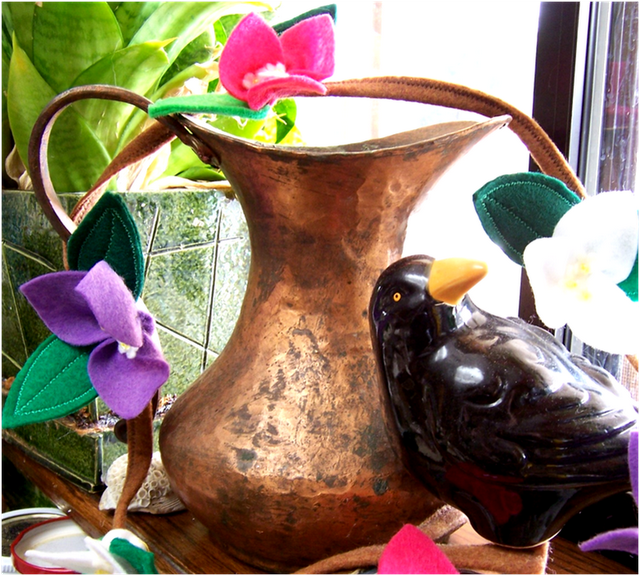 Deborah from Art Threads created beautiful felt Bougainvillea to brighten up your home. 1. Cut out a colored leaf/flower with the patterns found here. 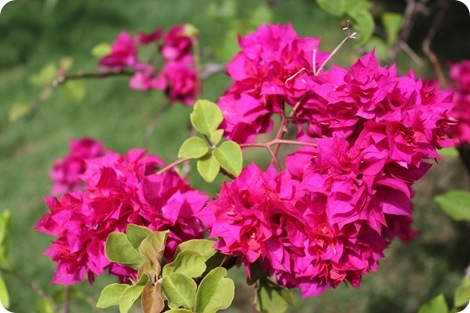 The colored part of bougainvillea is actually a leaf and the flowers are the little whitish centers. Using a double strand of thread and running stitches, sew around the center in a large circle. 2. Pull the two ends of the thread until you draw the circle up and crinkle the leaf/flower points. Tie thread very tightly. 3. Cut out three small flowers. I found it easier to just free hand these, but I’ve included a pattern in case you have very small scissors and want to try it. 4. Sew onto the top by bringing a needle up through the bottom, through the flower, through a large yellow bead, and back down to the bottom. Repeat this for the other two flowers. 5. Cut a piece of brown felt about 3/4 inch wide and as long as you want your garland to be. I had a 2 yard piece of felt, so that’s how long I made mine. If you don’t have any long pieces, you can sew shorter pieces together. Fold in half and zigzag along the edge. 6. Cut two leaves for each leaf need. Put the two leaves together and decorative stitch around the outside and up the middle. 7. Place leaves on garland base and sew in place. 8. Place a bougainvillea leaf/flower next to a leaf and sew in place on the back. 9. Repeat for all the leaf/leflowers and dream of tropical places! You can find Deborah’s latest project on her blog each Monday. Art Threads is full of great information and creative ideas! Thanks so much for sharing your beautiful tutorial with us! This is really fun and cute. The felt leaves are the best! Thanks for sharing. Wow! Nice info. Enjoyed the guest post. I like very much this flower. me fascino el adorno en fieltro, gracias por compartir. lo voy hacer gracias. This is good for home decorations especially for little feminine girls! Nice idea!